Designed to fit most stock and modified GM and Ford distributors. These modules feature solid state electronics to provide high coil output and superior reliability. A dwell control circuit ensures long, consistent coil charging and a current control circuit protects against coil overheating. These modules resist false triggering from the RFI of high output coils. Made In U.S.A.! Ford Thick Film Ingnition (TFI) coverage includes both modulators mounted on the distributor and remote mount applications. GM coverage includes HEI 4-Pin, Computer Controlled 7-pin and remote coil mount 8-pin applications. 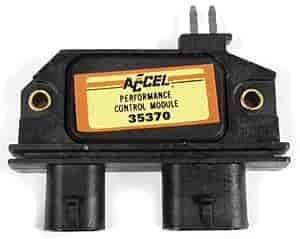 Does Accel 35370 fit your vehicle?